Tag line: "You May LOVE It! You May HATE It! But You'll Not FORGET It!" 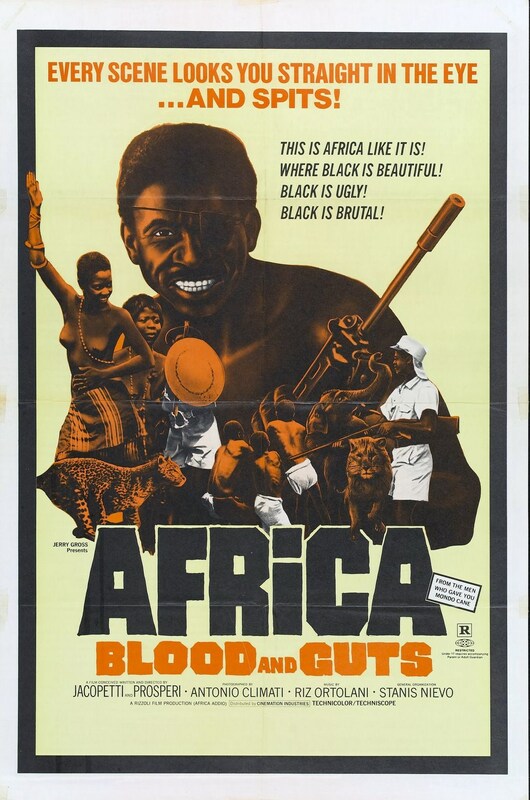 Originally titled Africa Addio, Africa Blood and Guts caused a bit of a stir when it was released in 1966. Condemned in its native Italy as a racist film, the movie has also been attacked for its scenes of incredible violence, and even though it's well over 40 years old, I find myself siding with the naysayers; time has done nothing to diminish this film's ability to shock you. 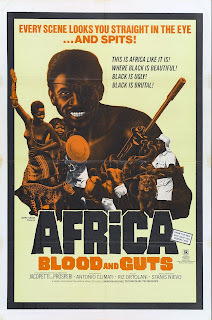 Directed by Gualtiero Jacopetti and Franco Prosperi (the creative minds behind Mondo Cane), Africa Blood and Guts is a documentary which reveals, in sometimes graphic detail, the political and social upheaval that plagued the continent during the tumultuous mid-60's. We're taken to the battlefields of various civil wars, such as those in Zanzibar and Rwanda, which claimed the lives of thousands, and join the big-game hunters as they track and kill as many of Africa's exotic animals as they can find. It's difficult to dispute the charges of racism leveled against Africa Blood and Guts by censors and critics alike. Early on, as we watch the last British Governor leaving Tanzania, the narrator spouts off about how Europe is “abandoning her baby”, at which point we cut to a celebration in the streets, where native Tanzanians are breaking thousands of Portuguese eggs in protest of that country's continued colonialism. It's a theme that resonates throughout the entire picture: European ceremonies of pomp and sophistication are followed by the chaotic, sometimes barbaric rituals of Black Africans, leaving little doubt as to where the sympathies of the filmmakers lie. Interspersed within the pandemonium of revolution are scenes of brutality, most of which take place on the Continent's various game reserves. In one particularly puzzling scene, a rope is tied between two jeeps, which then speed off in the same direction. Traveling about 20 yards or so apart from one another, they head straight for an entire herd of zebras, tripping up the animals as they're in full gallop. Even if one can excuse the grisly images of the Elephant hunt (carried out by both hunters and natives alike) as a bit of sport, there's really no “sport” in chasing animals down with automobiles! Not to be outdone, we also witness the violence of man against man, as evident in the static shot of a large pile of hands that once belonged to Watusi warriors, severed as punishment for their uprising. Even those going in with a morbid curiosity might find Africa Blood and Guts a difficult film to sit through, and while the movie, at over 2 hours long, is never boring, you may want to think twice before watching it. And if you do check it out, don't say I didn't warn you! Definitely I want to see this documentary. Zelle: Thanks for stopping by, and for the comment. As I said, this doc is certainly not boring, but it is disturbing, violent, and, at times, definitely racist. I'd be interested to hear what you think when you do watch it. Please be sure to stop back and let me know! Sounds like you're coming at it from a unique perspective. I'll definitely be interested in your take on the film. Holy Hell! I had never heard of this nightmare until now. I actually thought it was a documentary about the recent horrors associated with the "Blood Diamond" trade. You've blown my mind.